Posted by Madeline Patton on March 5th, 2018 at 12:00pm . When developing STEM outreach activities the task of obtaining high quality photos for use in online or print publications is often such a low priority that photos are forgotten completely or snapped quickly with a smart phone. The resulting images may provide evidence that an event happened but lack the pop that can engage audiences’ attention in the important work that educators do. Arrange in advance for a professional photographer to work at the event. Have participants or, in the case of minors, their parents sign photo releases when they register for the event. Use color coding on participants’ name tags to indicate those who are willing to be photographed. Provide clear directions to the photographer about who can be photographed. Announce when media professionals are present so that individuals who do not want to be photographed can move out of camera range for a few minutes. Overall, the SFAz+8 colleges have seen significant year-to-year increases in the STEM student pipeline in their outreach programs, early college programs, internships, and degree and certificate program enrollments and completions. A SFAz+8 Summer Science Camp at Arizona Western College introduced rural middle school students to chemistry and engineering principles with discovery-based lab activities. The red dots on the students’ name badges identify them as participants whose parents have signed photos releases. Abraham is the administrative secretary at Arizona Western College, which held summer camps for rural middle school students as part of the SFAz+8: Building Capacity for STEM Pathways in Rural Arizona project (Award 1400687). SFAz+8 is a collaborative of eight rural Arizona community colleges and Science Foundation Arizona (SFAz), a non-profit organization. The collaborative strives to improve the STEM student pipeline with outreach activities, summer camps, early college programs, internships for students, workshops for K-12 teachers, and program delivery with shared faculty. The eight colleges use common STEM metrics and data collection methods, and have aligned their activities with SFAz’s STEM Pathways Model. SFAz developed its STEM Pathways Model with support from another ATE grant. (Award 1003847). 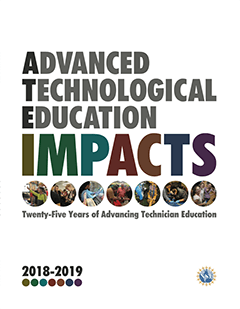 Read more about this project in the ATE@20 Blog SFAz Scales Successful STEM Pathways Model at Rural Arizona Colleges. Staff members at Arizona Western College (AWC) in Yuma, AZ, have mastered the art of obtaining excellent, publishable photos of young students. “AWC has a phenomenal campus photographer. We have requested Craig [Fry] to take professional quality photos of our participants in all three of our summer camps. “We have been fortunate that our events have been small groups and that I have signed the participants in and out of the camp daily, handing them their name tag daily. By the end of the camp, I remember their faces with their names so I can go back later and tag photos. Great thing is that Craig has a knack for getting a first name on many of the identification tags in case I need a boost. “When we originally send out information about the camp, we advise the parents that we will need permission for their children to be photographed. Again, because our camps have been a manageable number, on the first day we ask the parents whether or not they give the permissions. The parent then signs their child in and initials in a box we have created on the sign-in form for the parents who want to allow their child to participate in in-house such as flyers, AWC webpage, and social media to include news casts, newspaper articles, Facebook posts, Twitter…etc. “Once the parent has signed on the first day, every day after that the box is auto-filled (black box) so we know that the child can be photographed and we automatically add a colored dot to the identification tag. “As mentioned previously, the participants, instructors, photographer and any outside media who arrive in the classrooms during the event have been well versed on placement. Participants who are not to be photographed step aside or move behind the spotlight; while media first looks for the colored dot before taking any footage or photos. Although this could seem like a lot of work, the effort really pays off. Today visual presentations, whether people in action or data visualizations can strengthen your impact. The upper photo has the key elements of framing and drawing you into the center feature. It really makes an impact.